On a day in early February, Charlie stuck close to home in Plainfield, munching on hay just downhill from where Highland cattle lolled their fuzzy, square heads. He doesn't like to be far from his mom, Janet Steward, who owns Shat Acres Farm and Greenfield Highland Beef with her husband, Ray Shatney. When Steward approached, Charlie batted his long eyelashes blankly and waggled his big, fuzzy ears with pleasure when she began to brush him and coo compliments. From birth, Charlie was labeled a "terminal animal" — Shatney and Steward always knew his lifespan would be about 20 months. "He has only one purpose, and that is to produce beef," said Steward, explaining that the steer would not be passing down his half-Highland, half-shorthorn genetics. But his success as a breed cross might inspire a trend among Vermont farmers who are eager to profit from an animal well suited to living on grass and enduring cold winters. Charlie's life and death could end up serving as a template for big-money beef in a state far better known for its beer and cheese than its meat. And, in fact, Charlie — whom Steward called a "man of few thoughts" — had more in store for him than just becoming dinner. At Denver's National Western Stock Show in January, he had come in last in his market animal category. But for an extra $25, Steward and Shatney entered him in the show's carcass competition, judging the meat he would one day become. Such contests were once focused on actual dead flesh, but technology has brought the practice to life. The animal was taken from the show ring to an area where his side was shaved for an ultrasound. The scan revealed that an exceptionally generous portion of Charlie's physique consisted of the muscles that would become high-end cuts such as tenderloin and rib eye steaks. In short order, the living, breathing steer was named the competition's grand champion reserve carcass. Translation: His was deemed the second most valuable cattle corpse in the country — while he was still alive and well. Back home in Vermont, Steward publicized Charlie's victory in every way she could. In a February article in the Barton Chronicle, she told reporter Tena Starr, "We always believed he was special on the inside, and the carcass competition proved it." Steward invited Joe Emenheiser, the state livestock specialist for the University of Vermont extension, to come and meet Charlie. Emenheiser later complimented the farmers for recognizing "that crossbreeding is the most powerful tool in animal breeding." About Charlie he said, "He was a nice calf. He had grown well and was right at 12 o'clock as far as finishing" — meaning the animal was ready to meet his fate. Steward acknowledged her husband for this accomplishment: "Ray is very good at looking at an animal and seeing when they're ready," she said. Charlie's win may have garnered him a reprieve, but on February 16, it was time for his final trip. "The hardest thing I do is go to the slaughterhouse," admitted Shatney. "But our goal is for these cattle to only have one bad day in their life." Dying is part of living, and both are filled with indignity for all organic beings. 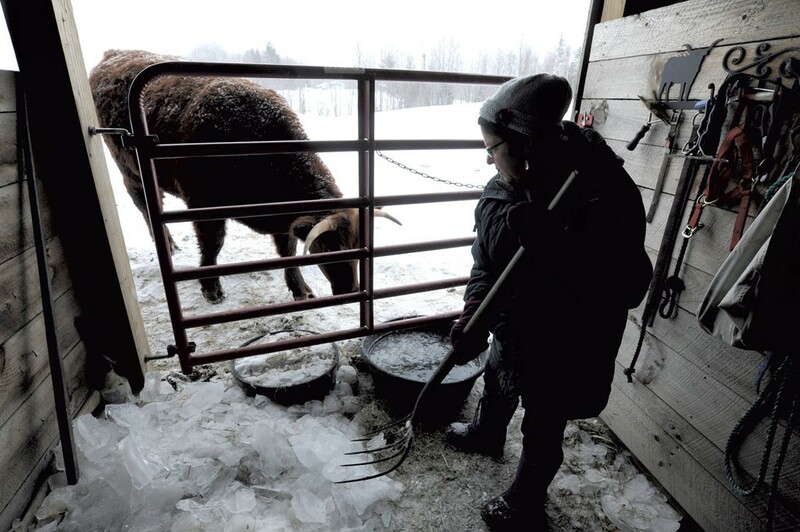 But at Sharon Beef, Darryl Potter tries to make animals' transition from life to death as easy as possible. He's a certified humane handler who lives on the same property as the facility. Outside the slaughterhouse, Potter's two affectionate dogs follow him closely. "They deserve a good ending," he said of the creatures he eases off this mortal coil. "I'm an animal lover even though I'm a butcher." Potter makes sure that his staff adheres to famed animal scientist Temple Grandin's philosophy of how to move his charges without frightening them, and he's strict with farmers, as well. Livestock delivered to the facility must be clean and drug-free. If the people unloading their animal are deemed cruel in any way, Potter will not process it. The slaughterhouse is also USDA-inspected, an indication of additional oversight that helps "keep the food supply safe," said Potter. Shatney and Steward were quiet in the car as they pulled Charlie in his trailer to Sharon, Steward recounted. He spent his final night in a clean pen with fresh hay and water. "Darryl likes for the animals to come a day ahead of time," Steward explained. "They eat in the pen so they're relaxed, and they're not loaded into a trailer then shuffled along." The next morning, Charlie was dispatched with a single gunshot to the head. His body weighed in at 1,350 pounds while alive, and came to a full hanging weight of 804 pounds. Steward said her animals' hanging weight is generally between 55 and 60 percent of their live weight. Charlie — on a winning streak even in death — showed his value at 65 percent. As his ultrasound at the Denver stock show had predicted, Charlie's high-end primal cuts were exceptionally large for an animal of his size. "The rib primal was 19.67 pounds, the largest we have ever had, with beautiful marbling," Steward wrote to Seven Days the day she collected the first half of Charlie's meaty remains. Potter was impressed, too. Charlie's shorthorn DNA gave him the advantages of thriving on a grass diet like a Highland, with the marbling and size of the larger breed. Compared to a full-blooded Highland, Potter said, "Charlie is a different category. It's like buying a Cadillac versus a Volkswagen. When you're trying to make money by the pound, there's no comparison." Steward took the meat home and cooked herself and Shatney a pair of Charlie's rib eyes. Seated at the dinner table, Shatney sawed away at the flesh, telling his wife that the meat was tough; Steward's heart dropped, she said later. But when she cut into her own steak, "It was like butter," Steward remembered. Shatney had been joking. "It was the best New York strip steak we ever had. I was just so grateful to Charlie." Other meat lovers can be grateful, too. In addition to the Capital City Farmers Market in Montpelier, most Greenfield beef is sold at Healthy Living Market & Café in South Burlington. Steward makes a delivery each Friday to Colin Driscoll, the store's meat manager and buyer. "It's the best stuff that we've had," Driscoll told Seven Days, explaining why he buys Greenfield. "Even before they were starting to do the crosses with shorthorns, the beef has always been really consistent and really tender." Aside from the significantly larger size of Charlie's steaks, what Driscoll noticed was the marbling. "It looked more like grain-fed beef, and it was a grass-fed animal," he said. 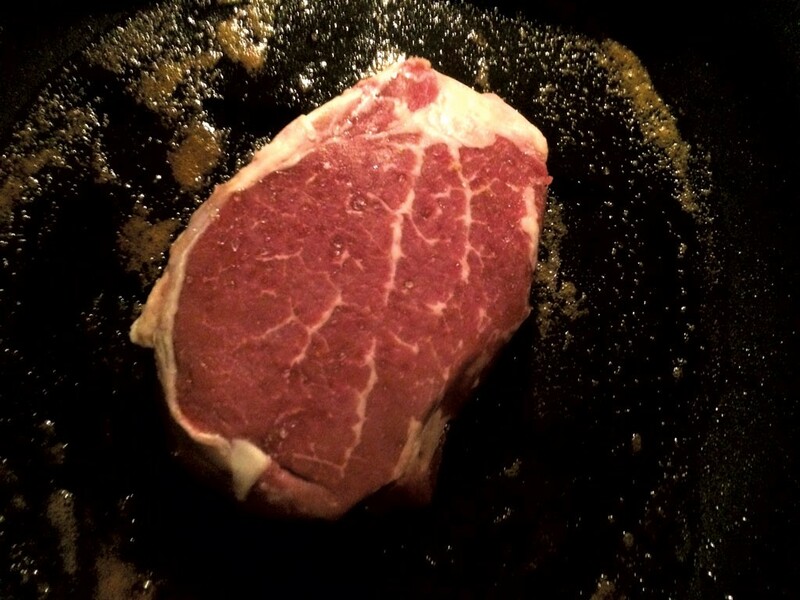 That means the meat had the soft, fatty texture of a western-style feedlot steer, but with the lower cholesterol and higher Omega fatty acids of grass-fed cattle. Driscoll admitted that when he prepares steak at home, it's usually from a grain-fed animal. But Charlie's meat seemed to combine the greatest advantages of both finishing methods. This reporter found the filet more forgiving than most; the meat seared effortlessly to a medium rare. Though this cut is generally tender, it is often bland. Charlie's cut had more external fat than usual, and therefore more to cut away, but it also had deep capillaries of marbling. This lent the meat a fat content that made it practically moo with beef's deep, mineral flavor. As for Charlie's short ribs, they fell off the bone after just two hours of braising — about half the time usually required to render down the fatty cut. In the ground beef, the fat made for a lighter color than that of other Greenfield cattle, but also an intensely beefy flavor. Greenfield created not just a medal winner with Charlie, but the start of something big in Vermont beef. Beginning next month, 30 more shorthorn-Highland crosses will be born at Shat Acres. "We're going to have 30 baby Charlies! We're so excited," Steward said. And with them, the cycle of life, death and afterlife will begin again. Heat pan to medium-high. Season steaks. Once maple butter is completely melted in pan, add steaks. Sear each side to a deep brown, occasionally spooning butter over the top. It's done when the steak is cooked to your liking. Set aside. Meanwhile, place kale in a flat-bottomed pot heated to just above medium. Add vinegar, and stew until kale is soft. Season as desired. Cook eggs over easy in melted truffle butter. As those cook, place half of the wilted kale on each plate and top with a steak. When the eggs are finished, plop one on top of each steak, with a little more truffle butter if desired. Voilà! — a tangy, earthy ode to Charlie's rich, beefy flavor. Heat oven to 375 degrees. In a small bowl, combine ground beef, bread crumbs, basil and egg with salt and pepper. Roll into about nine meatballs. Cook until lightly browned, so the meat holds together. Set aside. Meanwhile, lightly oil a pan and heat to medium-high. Add capers and fry until crisp. Set aside along with the meatballs. Lightly toast cumin and flour for about five minutes, until fragrant. Deglaze pan with wine. Once it has thickened to a milky consistency, add beef stock. Lower heat to medium and return meatballs to pan. Braise covered for about 10 minutes on each side. Remove meatballs from heat, add lemon and season as needed. Return meatballs to pan, and serve garnished with capers. Season and sear short ribs in a hot Dutch oven or braising pan. Once browned on each side, reserve ribs. Bloom spices in the tallow left in the pan until highly fragrant. Deglaze pan with coconut milk and return short ribs. 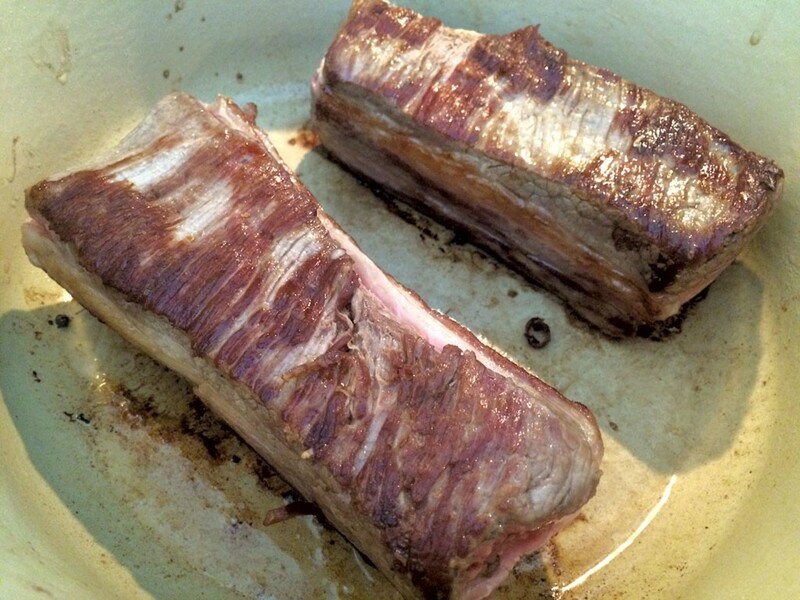 Braise on medium-low heat until meat nearly separates from the bone, two or three hours. Serve over basmati rice. Even brief visitors to the Green Mountains are likely to know the weathered face of Carroll Shatney. The farmer appears on the cover of photographer-writer Peter Miller's 2013 book, A Lifetime of Vermont People, wearing his favorite Champlain Valley Fair hat. His jaw is stoically clenched, his eyes sunken after nearly a century of looking out over the hills of Greensboro Bend. Shatney died in 2009, at the age of 98, after a lifetime of raising cattle at his family's Shat Acres Farm. This year marks the Shatney clan's 100th year farming the Greensboro land. For most of that time, previous generations operated it as a dairy farm. But Ray Shatney describes his late father as "the Barnum & Bailey of show cattle." In 1967, one of Carroll Shatney's friends sold him a Highland cow for $50 after a heart attack left him unable to care for her. "He always wanted something different," Ray recalls fondly of his father. "Highlands were such a conversation piece. Back in the '60s, no one had ever seen them before." Not that Highlands were anything new. Archaeological evidence places the widely built, hairy beasts in the rough-and-tumble Scottish Highlands as early as the sixth century. For a little context, Beowulf is thought to have been written sometime between the eighth and 11th centuries. And like the epic poem, Highlands may have Scandinavian roots: Some historians believe they came to Scotland when Viking and Norse settlers began to populate the region. The Scottish Highland Cattle Society, devoted to perfecting and standardizing the breed, was established in 1884. But it took far longer for the breed to catch on stateside. 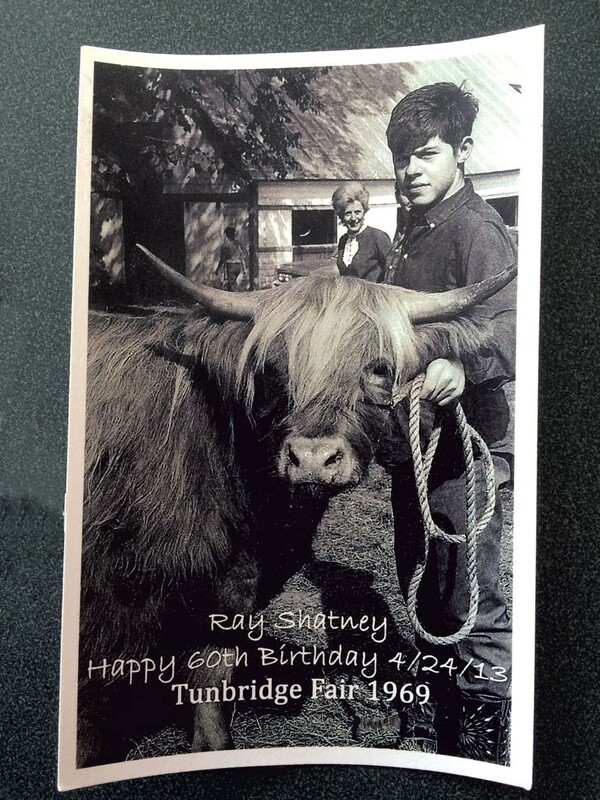 Ray Shatney recently learned that Shat Acres is home to the oldest registered herd of Highlands in the U.S. 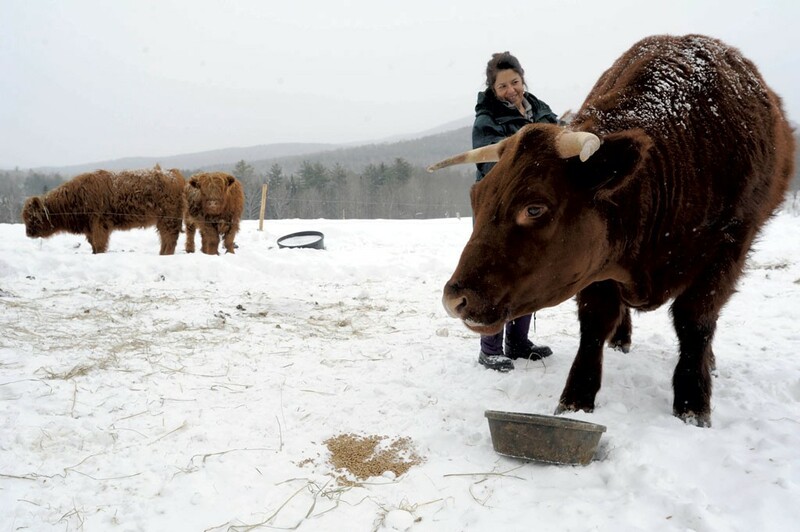 The second oldest herd in Vermont, at Trapp Family Lodge in Stowe, was originally populated with Shatney cattle. Carroll Shatney loved taking his cattle to fairs in the summer, not just in Vermont but in Connecticut and New Hampshire. Ray Shatney continues the tradition: To the dismay of other exhibitors, he brings a cow and its baby to the Champlain Valley Fair each year. "One person's comment was, 'They never look at our cattle; they only look at yours,'" Shatney remembers. At the National Western Stock Show in Denver in January, lines extended the length of a city block as people queued up to have their picture taken with award-winning cow Cinnamon Raisin. "Some people just want to be near 'em," Shatney says. On the way home from Denver four years ago, a Kansas deputy sheriff pulled Ray over just to get a closer look. The animals may look like the love children of a Wookie and an aurochs, but Shatney says their appeal isn't just aesthetic. Janet Steward recalls that when she first met Shatney, he was quick to tell her his stock wasn't just any old cattle. "They're Highlands, ma'am," he told her. Besides a reputation for being exceptionally attentive mothers, the animals are placid and docile, with quirky personalities. Shatney relates this as a cow scratches herself using a corner of the tractor on which he's sitting. "Sugar Plum is out there staring at me," he says of another cow. "It's so much fun to watch them." Steward adds, "The Highlands are very, very social animals. When we sell an animal, we tell people we won't sell just one. They won't thrive. They'll be looking for companionship." But Shatney can't watch them forever. He worries about the future of his herd. His daughter and son-in-law toyed with taking over the farm but decided that it was too much work. Shatney hopes that one of his seven grandkids will be as captivated with the animals as he is. Shatney is also collaborating with Steward's daughter, Aron, head of psychological services at Woodside Juvenile Rehabilitation Center in Colchester, to establish a program that would bring young offenders to the farm. "Troubled kids could learn so much, and their lives could change just being around these cattle," Shatney says. "They're awfully good medicine." Maybe one of those youngsters might want to take over the farm, he muses. Shatney's worries that cattle being born now might outlive him are probably unfounded given his father's longevity, even if the cattle's lifespan is about 20 years. Either way, it's unlikely that the story of the country's oldest Highland herd will end with Ray Shatney. The original print version of this article was headlined "Sorry, Charlie"